Capricorn's fiber statistics 19.5, SD 3.9, CV 20% and greater than 30, 0.9% reflect his tiny, deeply crimped fiber with an exquisite hand. 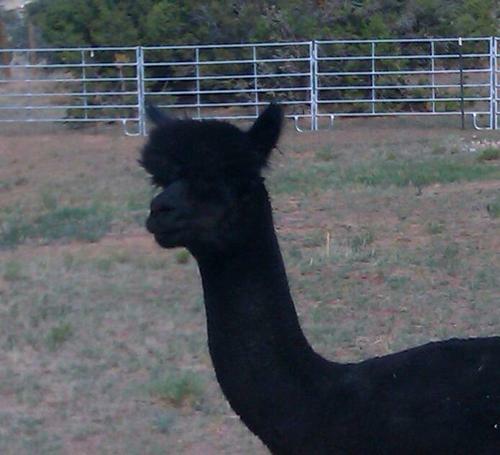 Capi has produced progeny ranging from white, fawn, black and rose grey. Their quality, recognized at Level V and IV shows resulted in first place and reserve color championship ribbons. He stamps his recognizable hand and stance on his progeny as well as exquisite advanced character fiber forming distinct, fine fibered, dense staples. fawn,grey and black. MFI Capricorn is an excellent choice for improving conformation, lowering micron and improving fiber character. 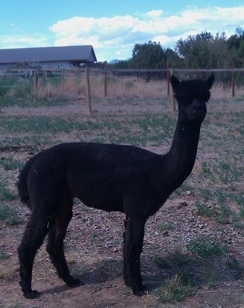 Rainman is a striking male with great presence, conformation and a uniform soft handling fleece. He has one female cria on the ground, dark brown, who inherited her daddy's great fleece characteristics - just what we were hoping for!